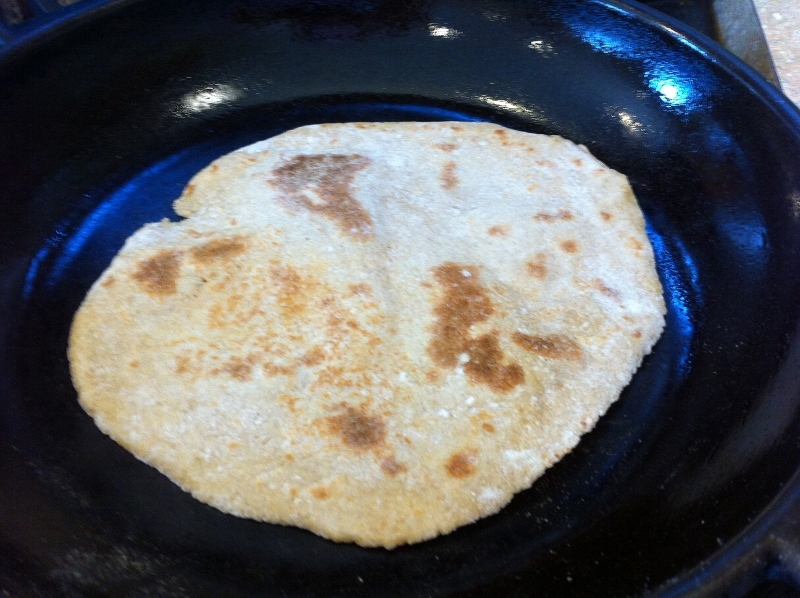 Chapathis are an Indian flat-bread, made by rolling out rounds of a yeast-free bread dough and frying them on a griddle or skillet. 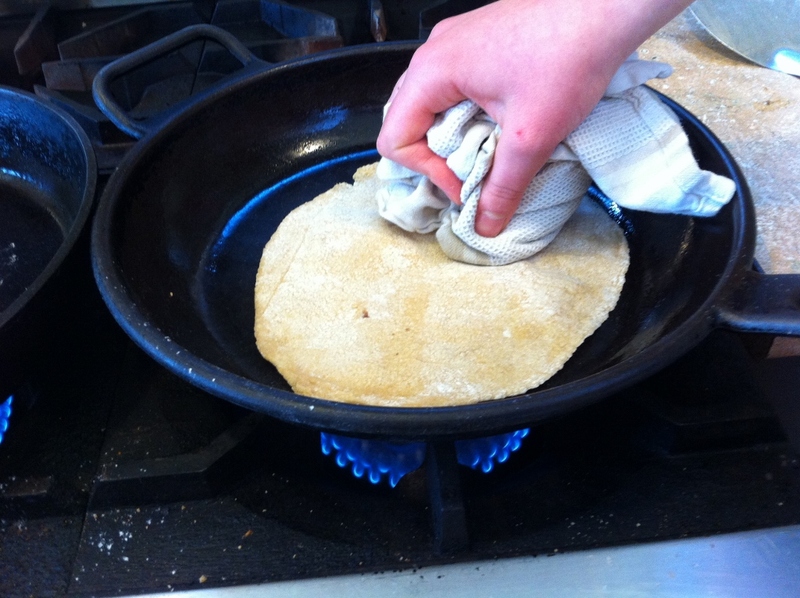 During the frying process, the dough is pressed with a clean dish towel so that it puffs up. Serve as a light meal, or a side. Pinch the dough into about 12 balls, golf-ball size. 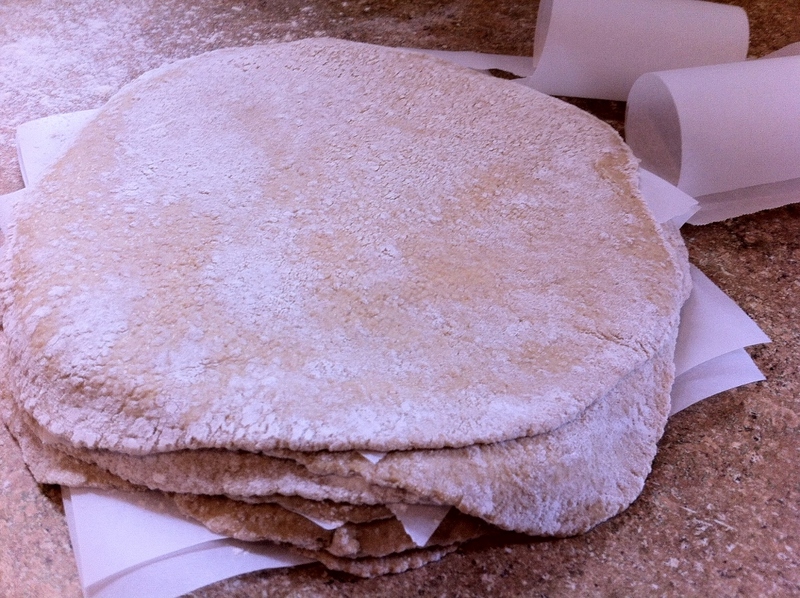 Keep them covered with a damp cloth while you first round each one smooth, and then, one at a time, flatten them with a rolling pin on a floured board, making them approximately 7 inches across. Don’t roll the pin off the edge of the round or the chapathi’s rim will get too thin. Shape them all, and stack with a little flour and waxed paper between. When you have only a couple to go, heat the griddle. It should be about pancake hot, a medium-high heat. If it is too hot, the chapathis will burn, but if too low, they won’t puff up. Best of all is to work together with a friend (or one of your kids), one rolling and the other baking. Keep an inverted bowl over the uncooked breads while you bake them one by one so that they don’t dry out. If your griddle is not well-seasoned, put a thin film of oil on it to keep each chapathi from sticking. The chapathis leaf flour on the griddle that will burn, so wipe it off as you go along. Now take a clean dish towel and form it into a smooth wad that is easy to hold. You will use this to press on the chapathi and encourage it to puff up. Place the first chapathi on the hot griddle and let it sit there for a second, then turn it over. Use the cloth to apply a gentle but firm pressure to the top of the cooking chapathi. Concentrate most of your pressing on the area just inside, but not on, the edge. Press down hard, but don’t let the cloth stick to the dough. The object is to help the chapathi form steam pockets; ideally it puffs up like a balloon, filled with its own steam. At first the bread may blister in just a few places. By pressing, you can enlarge these small bubbles. Turn the chapathi over as soon as the bottom browns lightly. It won’t brown evenly, especially if it has made the steam pockets, but will be a pretty pattern of brown and beige It is done when it is brown nicely on both sides, with no wet-pinkish areas. Chapathis are best when served immediately, but you can keep them warm in the oven until time to eat; don’t let them dry out, though. Our family likes to eat chapathis with butter, and sometimes we put honey and cinnamon on them too. As I was making this recipe to take these pictures, I figured I’d be a little adventurous and try making a chapathi sandwich. I cut a chapathi in half and covered each half with ranch dressing (you could use mayonnaise, but I like dressing on my sandwiches). 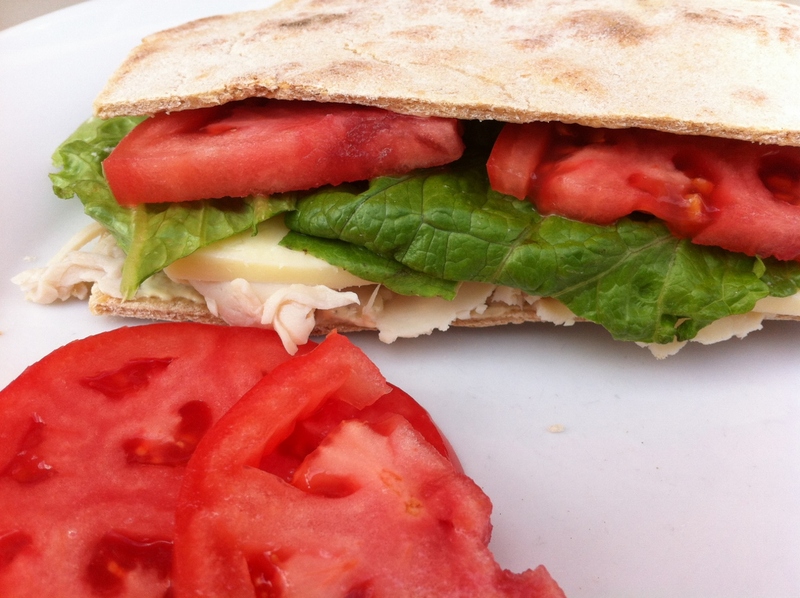 Then I added some turkey, cheese, lettuce, slices of tomato, and made it into a delicious sandwich.